Registration is open for the 2019 Academy! 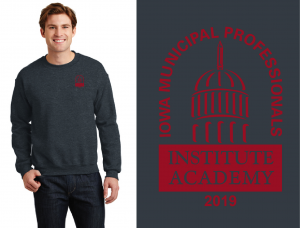 The Municipal Professionals Academy offers continuing education training for city clerks, finance officers and others to provide in-depth training for clerks and municipal staff to get useful, up-to-date information that will assist them in their job performance. opportunities to meet clerks from across the state - make friends and business acquaintances. updates on new laws, programs and technology affecting Iowa municipal government. an opportunity for credits toward recertification for IMFOA and IIMC sponsored certifications. Online pre-registration is required by July 17, 2019. Fees for the 2019 session is $185 and includes Thursday lunch. You can register here! NEW FOR 2019: A half-day QGIS course will be offered. The course is separate from the Academy and is $100 ($285 for QGIS and the Academy) but can be registered for at the same time you register for the Academy. This course will introduce participants to a free open-source QGIS software which participants will be able to take back to their communities for use in community planning and visioning. The Municipal Professionals Academy is paperless. You can view or download presentation materials one week before the event. We sell sweatshirts as a way to keep everyone warm (the rooms are sometimes chilly) and raise money to offer scholarships. The 2019 sweatshirt is a crew neck sweatshirt in grey with a red logo. Sweatshirts will be on sale until June 28th. If you wish to stay at the conference center, make your room reservations directly with Gateway at 1-800-FOR-AMES or (515) 292-8600. Please identify yourself as a Municipal Professionals Academy attendee and request the MPA room block. Visit Ames Convention & Visitors Bureau website for dining options.